This is my monthly column for The Catholic Free Press and Catholicmom.com. Words have power. Through prayer, guidance and meditation, the Bible can change lives. While God speaks most directly through his Word, he can also speak to you through the books you have in your home or that you find at your local library. It’s all a matter of being aware of how and when he is speaking to you. I developed a passion for reading four years ago after my mother had died. She had been ill for many years and all I could remember about her was her suffering. Reading acted as a balm upon numbing grief; it was an unexpected gift of grace from God. While cleaning out the family home I came up on my mother’s collection of books by Louisa May Alcott, each volume marked with her personal name plate. As I thumbed through the pages and enjoyed the familiar stories, I imagined my mother as a girl reading them along with me. I found myself wrapped in warm and happy memories of the woman I had called my very best friend. Books soon became a means of spiritual growth. Reading exercised a lazy mind and challenged my heart to open and grow. A novel of historical fiction was my first “breakthrough” book, one that shone a glaring spotlight on my soul and moved me to repent and change. 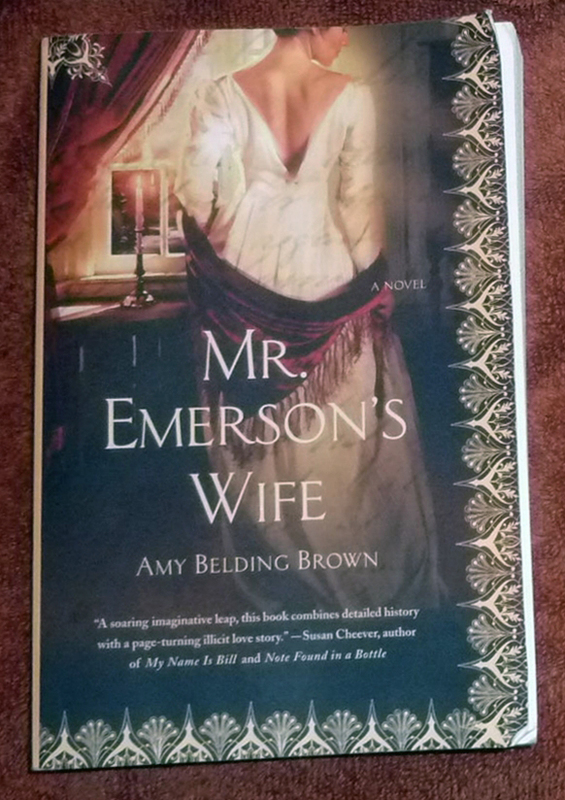 Titled Mr. Emerson’s Wife by Amy Belding Brown it told the story of Ralph Waldo Emerson’s wife Lidian. a highly intelligent and accomplished woman who, although married to an “enlightened man,” suffered the plight of all married women of her era. Just a scant one hundred and fifty years ago women were the property of their husbands; they had no legal rights. Women could not own land or a house, they could not vote and they had no lawful custody of their children. There were few options for gainful employment if a woman became widowed. Women in the nineteenth century were in essence invisible and powerless, unable to chart the course of their own lives. While wholeheartedly agreeing that all people are equal despite gender and race, I have never embraced modern feminism. This, however, did not give me the right to judge others who did embrace it. My judgment was harsh, secretly leveled at dear friends whom I otherwise loved and respected. After reading Mr. Emerson’s Wife, my heart began to open for these women with whom I had disagreed as I came to an understanding of their passion and point of view. I prayed to God for forgiveness and asked him to stretch my small heart, replacing judgment with love. He wasted no time in showing me how to love better and to leave all judgment to him. Other books challenged me spiritually. A series of novels by Chaim Potok explored the lives of people of great faith whose heritage clashed with their enormous gifts of intellect (The Chosen) and artistry (My Name is Asher Lev, The Gift of Asher Lev). Danny Saunders of The Chosen was a brilliant young man who was the rightful heir to his father, an Hasidic rebbe. Reb Isaac Saunders meant for his son to devote his vast intellect to study of the Torah while Danny hungered to be a scholar, feasting on the knowledge of the world outside of his Jewish community. Asher Lev was an artistic genius, compelled to create provocative paintings and drawings even if it put him at odds with his family and his own Hasidic community. Danny and Asher were young men of great courage who pursued their callings while remaining faithful to their Jewish faith. Their stories challenged me to dig deeper to find my own calling while at the same time, reminding me that such digging must be done in complete partnership with God, allowing him to lead me to self-knowledge. Think about the book you are reading now: how does it speak to you? Can you read between the lines and sense God touching your heart, moving you to change? Does your mind open up to seeing the world around you in a different way? Do you derive comfort from the book? Or does it challenge you and motivate you to repent of some sin? Does it inspire you to step out into the world and serve God’s people? Consider these possibilities the next time you visit the library. The next book you read could transform your life.